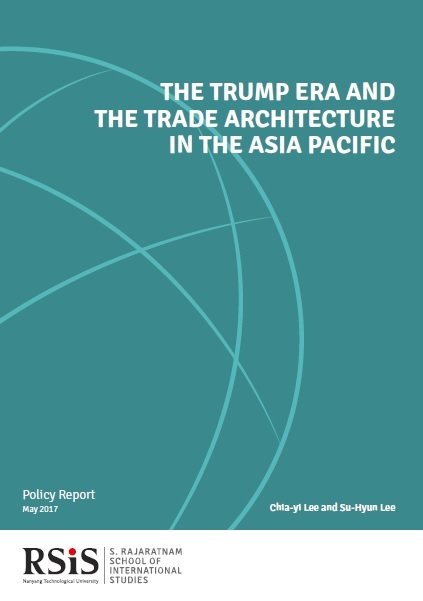 This policy report is born of the 2017 RSIS workshop titled “The Trump Era and the Trade Architecture in Asia Pacific”, which brought together experts in international political economy and trade from Australia, China, Japan, Singapore and the United States to discuss the transformation of the global and regional trade orders. At the workshop, participants offered various perspectives on the changing nature of the trade architecture in the Asia Pacific region amid the uncertainty brought on by Donald Trump’s election as U.S. president. The discussions covered a wide range of issues, including U.S. foreign policy, ongoing mega-regional free trade agreements, and the challenges and prospects of regional cooperation on trade and trade liberalisation. The first panel delved into the continuities and changes in the Asia Pacific trade order, focusing on the great powers’ strategic interests in the region. Assistant Professors Su-Hyun Lee and Chia-yi Lee of RSIS began by outlining the major direction of U.S. trade policy under Trump and its potential impact on Asia, especially China. They maintained that Trump’s protectionist moves, such as the U.S. exit from the 12-nation Trans-Pacific Partnership (TPP) signed in February 2016 and the threat of high tariffs on China and Mexico and on American firms doing cross-border business, posed a significant threat not only to the trade architecture in the Asia Pacific region but also to the very principle of free trade that embodies the World Trade Organization (WTO), with its multilateral trading framework. Professor Zha Daojiong of Peking University emphasised that the Regional Comprehensive Economic Partnership (RCEP), a proposed free trade agreement involving ASEAN, China, Japan, Korea, India, Australia and New Zealand, was neither China-led nor part of China’s strategy to compete with the United States in the region. He argued that a third template, preferably the proposed Free Trade Area of the Asia Pacific (FTAAP) that includes both the United States and China, would be ideal for the Asia Pacific region. Professor Ikuo Kume of Waseda University used survey evidence to show that Japanese Prime Minister Shinzo Abe had successfully sold the TPP to Japanese citizens because citizens linked the TPP to Abe’s economic reforms and to national security. Professor Kume expected that Japan might turn to bilateral trade deals with the United States after the U.S. withdrawal from the TPP, although these would be difficult to sell domestically. The second panel explored the future of trade under Trump from the perspectives of selected Asia Pacific countries. Reviewing Trump’s key policies on industry and trade, Professor Pradumna Bickram Rana of RSIS argued that the United States was now leaning more towards isolationism, insularism and mercantilism. He suggested that the ASEAN countries diversify their sources of demand and enhance regional integration through multidimensional frameworks, including the RCEP, FTAAP and bilateral and plurilateral free trade agreements (FTAs) with non-regional actors (in particular, the European Union). Professor Danny Quah of the Lee Kuan Yew School at the National University of Singapore expressed his concern that the election of Trump was in line with the recent rise of far-right populism across several countries. Regarding the trade architecture in the region, he suggested that the multilateral trading system was still critically important to Singapore as 80 per cent of its trade was organised within global value chains. In this vein, Professor Quah emphasised the importance of the RCEP in spurring regional development and facilitating competitive liberalisation, as the RCEP negotiations include not only trade but also other areas, such as investment, economic and technical cooperation, intellectual property, competition, and dispute settlement. Associate Professor Jeffrey D. Wilson of Murdoch University and the Perth USAsia Centre pointed out that many governments in the Asia Pacific region had been more actively than ever pursuing bilateral free trade agreements owing to the strained trade relationships between the North and the South. While pointing out the so-called “noodle bowl” effect generated by bilateral trade deals, he maintained that the Asia Pacific’s middle powers—Australia, Korea, and Indonesia—should re-establish the regional trade architecture with a more inclusive and integrated multilateral trading order and push harder for the completion of RCEP negotiations. At a lunch talk during the workshop, Professor T.J. Pempel of the University of California, Berkeley, discussed the broad implications of the election of Trump for the Asia Pacific region. He argued that the Trump administration would pose challenges to America’s relations with Asia and the Asia Pacific region, as shown in the president’s rejection of the TPP and the hostile attitudes of his foreign policy experts towards the idea of economic interactions with China. He strongly suggested that Asian leaders develop warm bilateral relationships with Trump and take advantage of the decreased U.S. presence in the region to make their own efforts at building cooperation. This report comprises of commentaries from six workshop participants delivering their thoughts on ongoing mega-regional FTAs and offering policy suggestions for Asia Pacific countries.